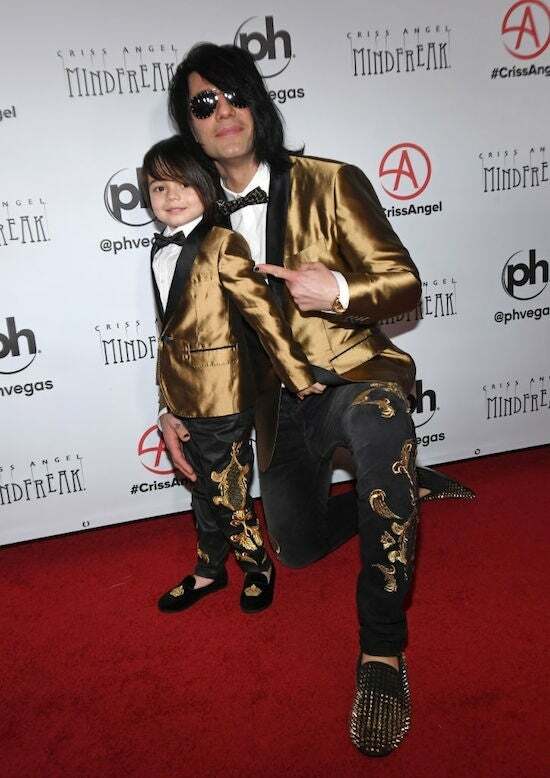 Magician Criss Angel is feeling the love from the Make-A-Wish Foundation after his 4-year-old son received the ultimate gift following his cancer treatment. Angel told TMZ that his son, Johnny Crisstopher, who was diagnosed with leukemia in October 2015, is now in remission — and that Make-A-Wish came through with the perfect gift. The organization helped arrange for Johnny to meet Ryan from Ryan ToysReview, the top-earning YouTube account of 2018. Make-A-Wish flew Ryan and his family out to Las Vegas, where Angel was throwing a celebratory bash to mark the end of Johnny's cancer treatment. In photos and videos from the fun day, which you can see here, Johnny Crisstopher appears quite starstruck by Ryan, who was smiling ear-to-ear throughout the day and giving Johnny tons of hugs. "I've been working with Make-A-Wish for many, many years prior to me even having a child, and I did about 50 wishes for children, and I raise a lot of money. I've raised millions of dollars for pediatric cancer," Angel said in a video published by TMZ. He added that despite his protests, the foundation insisted on helping celebrate the end of Johnny Crisstopher's chemotherapy treatments after three long years. "[Make-A-Wish] came to me and said, 'What would you like your son's wish to be?' I said, 'We don't need you to do that. It's OK; I have the means to make it happen.' And they were like, 'No, no, no, we want to do this for Johnny Crisstopher.' They insisted," Angel explained. "They got Ryan and his family to come out. I threw a big event for pediatric cancer and Johnny's end of treatment and Ryan was there," he said, adding that "we had rides, food and an amazing time." Angel, who raises money "every single show" for pediatric cancer research, told TMZ that he has raised "a few million dollars that we've donated 100 percent of." He's not finished yet, however, and said he's planning an "amazing event" where he hopes to raise $5 million for pediatric cancer in a single night. The 51-year-old showman said he'll pull off the event with help rom celebrities like Gary Oldman, Imagine Dragons and others. "We're gonna try to raise $5 million in one night right here in my theater with the most incredible talent from Hollywood and Vegas to try and do some amazing things and make a small little dent in this horrible disease," he said. In addition to Johnny Crisstopher, Angel and his wife Shauny Benson also share son Xristos Yanni, who was born on Jan. 22. "Xtristos Yanni came into the world at 503 today, Jan. 22, 2019," Angel said in the birth announcement on Instagram. "[We are] so blessed he's healthy. He's a beautiful baby boy, just like Johnny Crisstopher."